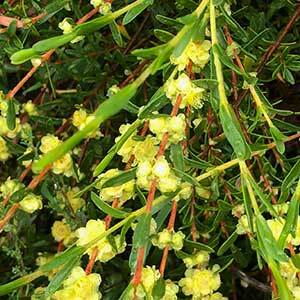 Commonly called the Golden Myrtle, Hypocalymma xanthopetalum is a small shrub from Western Australia. Generally reaching less than 1 metre in height, it will flower from winter into summer depending on the climate. The flowers are help close to the stems and are a golden yellow. Foliage is a mid to deep green. Hypocalymma xanthopetalum seems to be fairly adaptable in terms of climate, and as long as the soil is well drained and it gets good sun it is an easy care plant. Good examples can be found growing in gardens in the Dandenong Ranges in Victoria, a far cry from its native habitat. This is an excellent plant in the garden and can be grown in containers if needed. Ot attracts bees, birds and beneficial insect top the garden and the flowers, on long stems are useful as cut flowers. Plant is a sunny position in a well drained soil. In containers use a native plant potting mix. You can prune the long stems for cut flowers. General pruning to encourage a dense growth habit it should be carried out immediately after flowering. In good soils, little to no fertiliser will be required. Height – From .5 metre to around 1 metre. Spread To around 1 metre. Flowering Time – Spring through summer and into winter depending on climate. Root system – Not invasive.